Yesterday involved entirely too much hair-dryer action. Today we would get up even earlier to avoid it. So, we got up at 4:45 which is actually 3:45 in our home time-zone, which we left less than a week ago. As I write this it’s 6:20 PM and Dachary and I just forced ourselves up from a nap, because sleep is an evil thing that must be avoided at all costs…. or something. I’m not sure. I think I hear its siren call still. 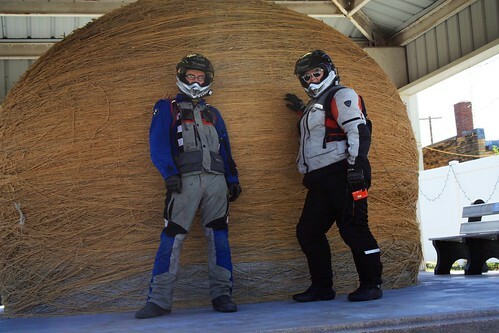 After we posted the Day 5 report we went out and finished Day 5, which involved the 5,000km service on the bike. Oil looked good, hardly any schwarf in it (yay) transmission oil looked good, and had… less schwarf than the last time (almost yay). It had started out as a Pepto-Bismol pink and had ended up a dirty sock pink. I demanded that the final drive fluid be changed because after checking it’s level earlier I knew that it no longer resembled Pepto-Bismol in any way, shape, or form. It was just disgusting and nasty and filled with schwarf, although, in its defense it was less than last time. Dachary and Ben got things started, Dido guarded the tools, and somehow I ended up covered in fluids and grime. I always seem to be the one who ends up covered in fluids even though Dachary is the gear-head. 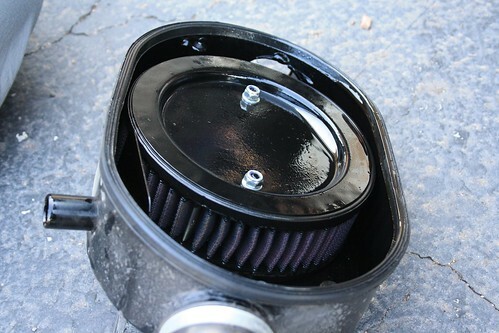 … There’s always oil in the air-box. It seems to just be what Ural’s do. 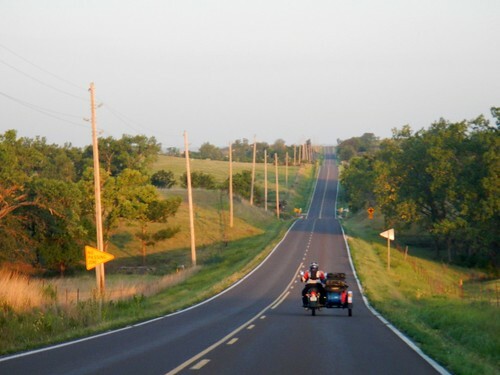 Or, at least what our Ural does. This, of course took way too long. It was 103° when we started with a mild-hair-dryer of a breeze. It was fully dark by the time we finished. Fortunately there was an auto parts store still open at whatever late hour it was, and I carried the container over to them for disposal of its fluids. The container itself magically disappeared sometime thereafter. It’s my story and I’m sticking with it. Day 6: for real this time. Like yesterday, I walked the beasts while Dachary addressed the assorted little bags and things we’d left scattered about the room. From the hill of desiccated grass behind the hotel (all the grass is desiccated out here) I could see the nearby bank sign reading, “5:15 AM” and then “88° F”. The air felt slightly muggy. 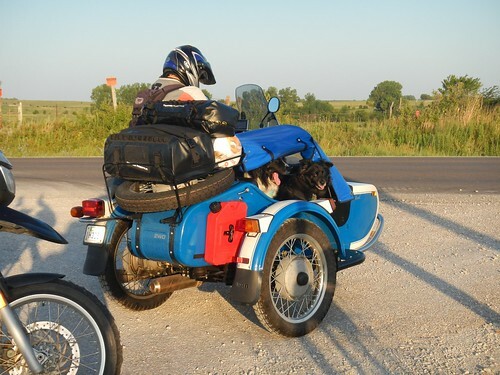 The dogs climbed into the sidecar while we finished packing it, and after a quick stop at the gas station we were on the road again. We’d decided to try and take back roads today, rather than the interstate and a couple hundred yards after the gas station she said “I was looking for 24 but I don’t see it. Let’s take this left. (onto 16).” It was going west. Who was I to argue. 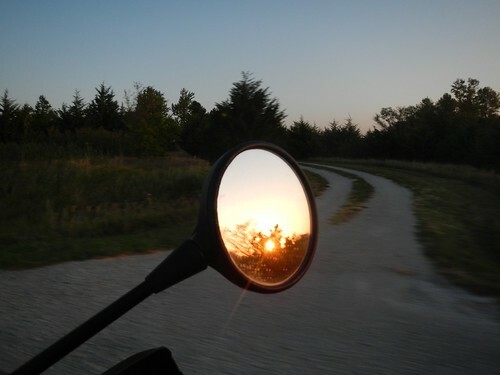 With the sun just peaking past the horizon we whooped as we crested the rolling hills. The air felt cool… er than yesterday, and the sun wasn’t trying to blind us with her bazillion watt bulbs yet. After a certain crossroads Dachary felt the GPS was being led towards it’s own siren call of Interstateness, and called a halt. A map needed to be consulted. The GPS was instructed to stick-it, and we turned the other way. 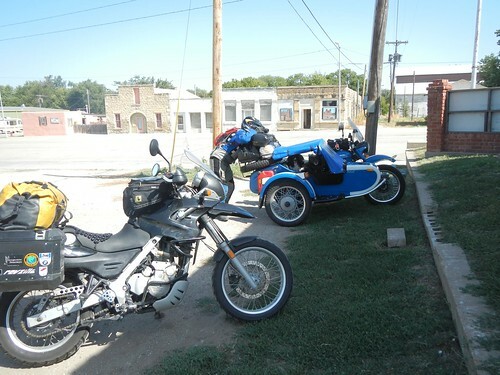 In Randolph, KS we found a gas station, come convenience store, come hardware store, come local farmer’s hang-out, with some shade, and a bench. at 7:30 in the morning shade was already a significant criteria. We talked to some interesting folks, ate some bleh pre-made food followed up with two delicious home-made danish-like things and hit the road after first forgetting to check the oil level. I was having trouble staying awake again, even though we were on a more interesting back road. The heat? The fact I’d just eaten? I dunno. At the next gas stop Dachary made sure I drank some Mountain Dew. Then we took off after first forgetting to check the oil level…. again. Dachary remembered less than a mile down the road, and we decided to pull into an ex-gas station that was in the midst of being transformed into a mexican restaurant, across the street from another mexican restaurant in a town with probably less than 1,000 people. I don’t foresee a great future. I parked in the shade of the ex-gas pump overhang thing, and quickly checked the levels, trying to get the dogs back on the road ASAP because the sun had caught up with us, and everyone was hot. The level was perfect. I don’t know how we managed to guess it so well. 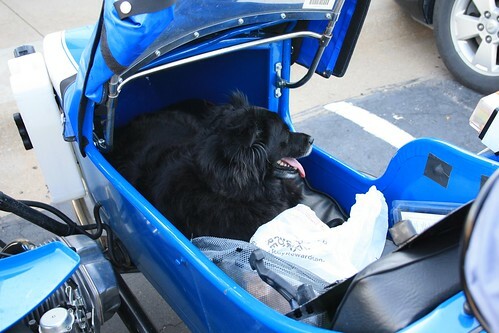 Ride, gas, ride, gas, ride, gas, ride… Dachary needed a pee break. We pulled into a Casey’s General Store, which is quickly becoming our favorite gas / convenience store chain in the midwest. This is due to the fact that they’ve got clean non-stinky bathrooms, tasty cookies when we want them, and in this case A SHADE TREE!! We were thrilled. What was supposed to be a quick pee break turned into a break where the dogs got out, we got fresh cold water, and shared a diet coke. All because of a shade tree. While there a couple guys came by and checked out the Ural. One of them owned a BMW R1100, talked slowly, and had zero emotional response. I am convinced he was a robot. 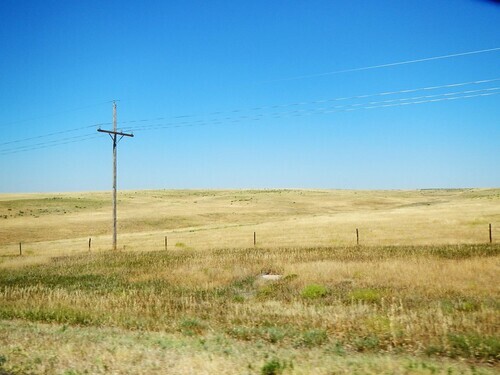 They have stuck him in this small town because people expect robots in big cities but no-one expects a robot in the middle of nowhere Kansas. At some point in the day Dachary spotted a sign as we entered some town proclaiming it to be the home of The Worlds Largest Ball of Twine. Dachary laughed. As soon as she told me what she was laughing about I demanded we find it and stop. I explained that I’d been wanting to see this for years. It is one of the great American… insanities. Such a ridiculous thing to create. I was thrilled. I was so glad we got to see it, but it was so hot we had to pull in, set up the camera, run up, pose, repeat, get and hop back on the bikes as fast as we could to get airflow back on the dogs. I barely had a moment to touch its twiney goodness and walk quickly around it… so awesome. There’s hardly anything growing out here. Ride gas, … ri…I’ve got too many ride gasses in here… maybe. There was a lot of riding and a lot of gassing up. Eventually we found ourselves behind a Prius, surrounded by corn, and moving nowhere thanks to a scary-thin woman with a cigarette and a very large stop sign on a pole. We waited. My bladder pulsed. We waited. I eyed the telephone pole. We waited. I eyed it harder. I tried to focus on keeping myself between the sun and Ben. My bladder pulsed. I would have totally gone and peed on that telephone pole with the lady standing right there but I was convinced that the moment I got off the Ural Murphy’s Law would kick in and I’d be stuck peeing on a telephone pole for the next two minutes (it was a lot of pee) while the line of unhappy drivers behind us got even more unhappy. I should have taken a picture. I would have taken a picture, but I was all focused on the telephone pole, the sign, and keeping shade on the dog. After fifteen minutes a Pilot Car showed up, the sign woman switched with another woman, and we were off, at a very sedate pace, past a road crew laying a very nice looking bit of new asphalt. They were probably insane for laying asphalt in that heat, but they were still doing a good job. Six miles later we reached Colby, my bladder still pulsing, and went with yesterday’s plan. Get a hotel before everyone fell over dead from the heat. Hotel acquired, we went to the room, to find the cleaners hadn’t finished our room yet. They’d open the doors of all the rooms along this stretch of the wall for some reason. Dachary was all “Go tell the manager and get a different room.” which I was about to do until the cleaners popped out of the next two rooms and in that very happy to please you head-bobbing Indian way. “10 minutes” the man said, with a thickly accented grin. “ok” I said, only to look over and see Dachary glaring at me. I took the dogs for a quick walk while we waited, and Dachary started grabbing stuff off of the bikes and piling it in front of the room. She didn’t talk to me for the next five minutes, which I think was one-part glare residue, and one part sheer exhaustion. Soon though, we were in air-conditioned goodness, and my bladder was finally allowed its release. When the topic of food came up, as it is wont to do after hundreds of miles spent in 3 digit temperatures, Dachary practically cried when I listed off the places I had seen within walking distance of the hotel: Subway, Arby’s… I would have continued the list of similar venues but for the cry of “No more sandwiches!! !” She had previously made it clear she wanted a “large chunk of meat”. I would have been happy to oblige her, but had no clue what was available in town. Fortunately, the Quality Inn had provided a large folder listing things like that, including a listing for an “Authentic” Mexican restaurant that lived within this very hotel, and displayed pictures of things you would never find in Mexico, one of which was “Steak A La Mexicana”. She ignored the obvious and focused on the “large chunk of meat” that it promised. I was sent to retrieve meat. When I returned, Dachary was in the shower, and upon emerging mentioned that she has discovered a heat rash on her lower right leg. This compliments the sun burn on my neck and ears quite well. 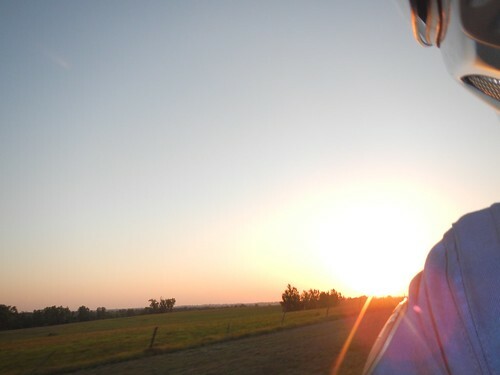 The last few days I’ve been somewhat religious about wearing my Buff and tucking it up under my helmet to keep the sun off of my neck. After our 3:30 lunch / dinner …thing I declared that a nap was required. Dachary disagreed: responsibilities, posts to write, Ural dealers to contact, headsets to acquire (I’ll get to that). Damn these nap thwarting things! I looked up. I called. However, as she climbed onto the bed beside me to start the image work, while I started the writing the horizontality of the bed captured her. She was convinced. A nap would be had! The alarm was set. The dogs were loaded onto the bed. The sleep was upon us. Then the Ural dealer returned my call. Argh! I never really made it back to sleep before the alarm went off. As for the headset. Dachary’s Uncle does seem to have fixed its dying problem, but Dachary and I are both getting frustrated at the fact that I can only hear 80% of her words when at speed. It doesn’t sound terrible, but you try understanding a conversation when 20% of every sentence is missing. It gets very annoying very fast. Some sentences are never fully comprehended. I know it’s gotten worse since the trip. I think the degradation has coincided with Dachary getting the upgraded headset. We used to always have some trouble at speed, but these days she claims to be able to hear me perfectly. Tomorrow we shall switch helmets to confirm that it’s not just old age catching up with me. 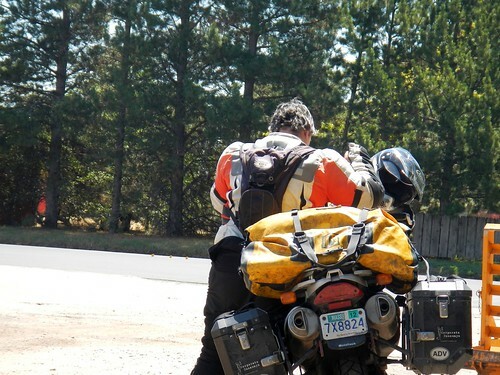 For reasons we don’t understand we both wear the same size helmet, gloves, and shoes. It has its advantages. Assuming she has as hard of a time hearing me tomorrow morning as I do hearing her normally, a new headset shall be in the purchasing, if for no other reason than to stop filling her rides with frustration. I’m not quite as frustrated, but that’s because what I’m trying to communicate is always understood. Unfair, but true. Today, I wanted to drive the Ural even though it was Kay’s turn to see if there was a boost in its performance compared to yesterday. It might have been ever-so-slightly better… I managed to pull 65MPH again a few times – but it was still being inconsistent. 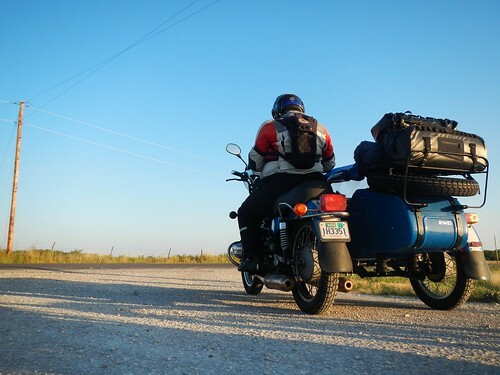 I just crunched the numbers on mileage for the past few days – I’ve recorded every tank of fuel since we got the Ural – and yesterday all of our mileage was below 20 MPG. (For comparison, though, we’ve only been getting around 21 MPG on the trip before this… yesterday was 18.5 to 19.5 MPG so it was only a slight fuel economy loss. Today we were back up to 21 for one tank, then down to under 20 again for the next two tanks (19.8 and 17.46, which is officially our worst mileage ever) and then up to 25.86 MPG… but all of this was at roughly the same speed range and conditions. The Ural definitely has me scratching my head. On a related note, when we disassembled the petcock we found a disturbing pile of metal shavings around the bottom of the straws. The filters on the straws seem to be doing their thing and keeping the debris out of the fuel line. For the non-Uraling readers, this is not unexpected. What ever you can’t find at Sharps you don’t need!